Rain showers were forecast for Alacatraz day, but I have a feeling that the Resident Offspring's timely purchase of a lucky cat was what warded off the wet until after we returned. Negotiating those hills (the equivalent of a 13 storey building) would have been rather treacherous in the rain. The island looks very ominous as the boat approaches, with its burned out buildings high about the cliffs, empty eyes where the windows once were, gazing at you reproachfully. The grounds themselves are surprisingly lovely. Lush vines overgrow the cliff walls lining the stone road that criss-crosses its way up the steep hill. The western gulls scream accusations at you as you trudge up to the cell block at the top. The tour of the cell block is self-guided, with directions provided on your headphones by the voices of actual Alacatraz prison guards. The audio tour is exceedingly well done; the directions are authoritative and gruff, treating you as a prisoner as you are ordered around the prison and told some of the stories of life on the rock. You simply can't go to San Francisco without seeing Alcatraz. 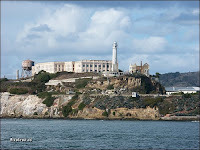 Besides, the lookout point at the top of the hill, just outside the prison control room, has the most spectacular view of the San Francisco skyline, a mere mile and a quarter away. You can see how the city undulates gracefully over a series of hills. Whilst walking through the city the day before, I was struck by how the intersection we were stopped at continued uphill in three directions, and I figured that we must have been standing in a bowl. From Alcatraz, I could see that this was indeed the case. Odd and lovely place! When we disembarked, we went in search of the sea lions that hang out at Pier 39, many of them year round. We had seen one lounging in the setting sun on our first day, but Hillary told us that they generally hang out by the dozens. Sure enough, there they were, at least 70 sea lions, clustered on the piers, big ones and baby ones, sleeping ones and barking ones, swimming ones and fighting ones. They were charming and we watched for a long time. We didn't even think they were all that smelly. Then it was a break for a quick early dinner from a table overlooking the harbour, and off to find Musee Mechanique, which Will had recommended. This free museum is a personal collection of vintage mechanized games and arcade machines. I had expected that we would tour through it in about 20 minutes, but we ended up spending close to 2 hours there. It was so amazing and way too much fun! These were actual working games and we spent many quarters playing pinball and shooting games and boxing matches and pac man. There was even a vintage peep show. By this time it was early evening and we continued our stroll down The Embarcadero, reading posted menus and looking for the perfect place to eat our final San Francisco dinner the next night. The Embarcadero was alive with street performers and music, everything from living statues (no crusty jugglers thank god) to fire-eating clowns to bongo players. 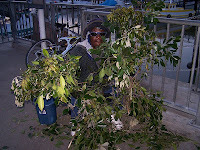 Our favourite, however, was the Bushman. We joined the crowd of giggling spectators who watched in anticipation as hehid behind a fake bush and then startled people as they walked by. Apparently he has been doing this since 1980. A simple act but it never gets old. On our final full day in San Francisco, we are going to attempt to see everything else. Okay, maybe just some museums. And eat some more cioppino. I guess you are having your last day in paradise right now. Partake to the fullest, and give us the details, as we endure yet another day of snow in western Manitoba. Oh Berni,you guys really should have come with us! Seriously! I want to play some pinball. That museum sounds like ever so much fun. So how much did this "free' museum cost you? How lucky for you guys to have met up with Hillary and Will to find out about the seal's hangout and that museum. I was worried for a minute that my past had caught up with me, Gifted, but eventually they let me go. It wasn't too steep, Toccata, I think we each spent about $5. Well worth it to rule at Addams Family pinball! The sea lions were so great.